FIGHTING SUN (AUS) (Bay 2011-Stud 2014). 2 wins at 2, ATC Canonbury S., L. Out of SW Irish Darling. Sire of SW Chess Star (MVRC Valley Pearl, L), SP Platinum Mam'selle and of Fighting Harada, Fighting Dragon, Magic Sunset, Miss Scorcher, Luen on Fortune, Empire Legend, Me Cabo, Meteor Rising, Naduri, Sunfighter, True Finesse and of the placegetters Aten, Rapid Eye Movement, Aurora Sunset, Ausfighter, Darmasun, Fast Stepping, Fighting Faith, etc. His oldest progeny are 3YOs. I Am Special (f. by I Am Invincible). 4 wins at 900m, 1000m in 2017-18, 3d ATC Australian Turf Club H.
Miss Scorcher (f. by Fighting Sun). 2 wins at 2 in 2017-18, 2d ATC Events Sprint H.
Turn Seventeen (f. by Sebring). 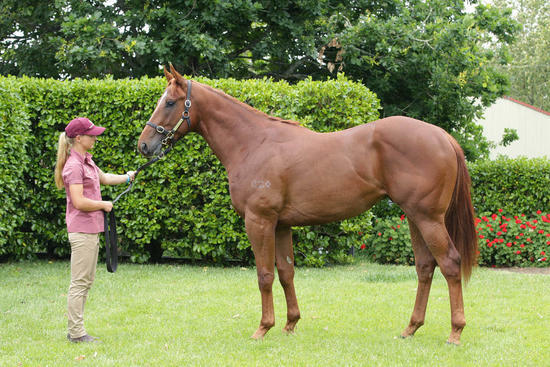 Winner at 1200m, 2d ATC GWA Boral Roofing 2YO H.
Special Strike (f. by Stryker). Placed to 2017-18 in Aust. Step Right Up. 2 wins-1 at 2-at 1400m, A$94,035, WATC Westspeed Nursery H., Tabtouch Bet Local H., 2d WATC Rotary Club of Perth H., Dee Dee's 60 H., Tabtouch With Cash H., 3d WATC Club Membership H.
Brauhauser. 2 wins at 1200m, 1350m, 2d BRC Ascend Sales H., 3d BRC Sky Racing World H.
Special Mention. 2 wins. See above. Hotel Splendido. Winner at 1600m in Aust. Enzedbee. 3 wins-2 at 2-to 1400m, Rotorua RC Carson Taylor Ford 3YO H., Hawkes Bay Charlie Fergus Juvenile H., 3d WRC NZ Bloodstock Bonus 2YO H. Producer. STAVKA (Xaar). 7 wins to 1400m, A$237,900, VRC Hong Kong Jockey Club S., L, Terry Watson H., MVRC Hats off to Des Gleeson Flying H., 2d VRC Aurie's Star H., L.
SPECIALIZE (Bluebird). 6 wins to 1350m, A$158,608, AJC June S., L, 2d STC Civic H., L, 3d NSW Tatt's RC Carrington S., L, Gosford RC Pacesetter S., L. Sire. BOMBER BILL (Air de France). 23 wins-7 at 2-to 1400m, A$1,892,330, WATC Karrakatta P., Gr.1, SAJC Goodwood H., Gr.1, MVRC Australia S., Gr.1, AJC Challenge S., Gr.2, MVRC Schweppes S., Gr.2, AJC Liverpool City Cup, Gr.3, VRC Gilgai S., Gr.3-twice, SAJC DC McKay S., Gr.3, RN Irwin S., Gr.3, 2d MVRC Schweppes S., Gr.2, QTC Cup, Gr.2, 3d QTC Cup, Gr.2. SPECIAL SONG (Song of Tara). 11 wins-1 at 2-from 1000m to 1800m, A$282,800, Qld Tatt's RC Members Cup, L, 2d BTC Bernborough H., L.
DISTINCTIVE DARCI (Darci Brahma). 9 wins to 1200m, S$913,754, to 2018, Singapore TC Merlion Trophy, L, 3d Singapore TC Colonial Chief S., L.
KURO (Denman). 8 wins-1 at 2-to 1200m, A$731,025, ATC Heritage S., L, 2d ATC Galaxy H., Gr.1. EVER LOYAL (Sebring). 2 wins at 1400m, 1600m, NZ$126,225, in 2017-18, CJC Zacinto S., L, 3d New Zealand Two Thousand Guineas, Gr.1.